PHOENIX — Howard Kamarata was a pipe fitter by trade, a home handyman by desire. It was thehandyman work that got him in trouble. Kamarata was at home one day last October, working on an outdoor project. He had solar lights, the kind that sit atop 4-by-4 posts, and he needed extra height. He set up his miter saw — a type of saw that moves on a hinge, up and down through wood. The piece he had was short, and he wanted to cut it into 2-inch sections. Being right-handed, he guided the electric saw with that hand and held the wood in place with his left, near the cutting surface. Before he knew it, the saw caught the wood, throwing it toward Kamarata. His left hand slipped into the blade. Four fingers, just above the middle knuckles of his left hand, were gone. He saw the blood and passed out. He woke up and made it to the house. He remembers realizing that he needed to find his fingers. "We keep chickens," he said, "and all I could think of was, 'I hope the chickens don't get my fingers.' "
He fainted again before waking and calling his wife, Pat. They dialed 911. Medical techs found the fingers and brought them along. Kamarata was flown to Banner Good Samaritan Medical Center in Phoenix, where he was told his fingers, except for the pinkie, could not be saved. The damage was too severe, his stubs too mangled. Pat signed the papers allowing amputation. 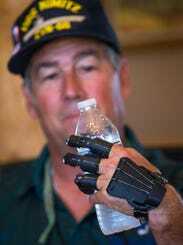 The procedure created nubs out of Howard Kamarata's three main fingers, while the pinkie was reattached. He had worked with his hands for 35 years as a pipe fitter, at least that long as a handyman. "You can't be a pipe fitter with one hand," Kamarata said. He fell into a depression.
" 'What am I going to do now?' That's what I thought," he said. "What would I be good for?" Living without the use of his hand was not an option. He needed to find a solution. That solution would come from new technology and a few items from Home Depot. It would be the ultimate do-it-yourself project, one that would provide hope for other finger amputees. Injuries to the hand, including amputations of fingers, are surprisingly common. According to the Centers for Disease Control and Prevention's National Center for Injury Prevention and Control, about 41,000 people a year suffer non-fatal injuries that lead to amputations of one or more fingers. More than 75 percent of the injuries happen because of trauma caused by accidents like Kamarata's. They affect mostly young children and men older than 55. For the young ones, the injury comes 73 percent of the time from fingers being slammed in doors. For older men, power tools account for almost half of the amputation accidents, studies show. Kamarata, 57, fit the statistics perfectly: an older man injured using a power tool. He would not be able to return to work as a pipe­ fitter, but for his own self-image, he wanted to use his hand again. Whether it was picking up a telephone or holding a bottle of water, Kamarata learned quickly how much he took his hands for granted. He was especially troubled by how much it could cost for prosthetic finger replacements — into the tens of thousands of dollars, depending on a patient's needs, the severity of the injury and other factors. Advanced prostheses can cost up to $40,000. "It was going to cost me thousands of dollars per finger," he said. He couldn't afford it. The costs put Kamarata in a difficult position. He could survive without a prosthesis. But without use of his left hand, he believed he had lost more than 50 percent of his ability to do what he wanted to do. He spent about a week in the hospital to make sure the nubs of his fingers healed, but he wouldn't leave his home after he left the hospital. His wife, Pat, forced him to go out. They went to a church function, and there, he ran into an acquaintance, Casey Barrett. Barrett, an industrial designer, was curious when he saw the bandages on Kamarata's hand. "You could see he was shaken by the experience," Barrett said. "So I asked him what happened." "A few months earlier, I had seen a video online of someone who made a hand for a child," Barrett said. "I thought it was really cool. I did some more research, and found someone who had made a design that would work for Howard." Kamarata remembers the moment. "He said, 'Let's make you some fingers.' Pat and I just smiled." Barrett went to work. 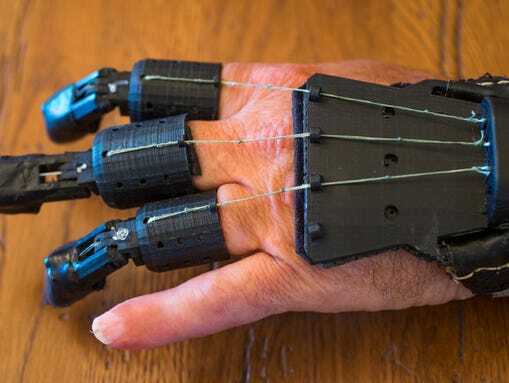 He found a supportive Internet community and plenty of free information, including templates for finger prostheses that provided printable files based on measurements provided by users. Barrett found virtually everything he needed online and was able to track down time on a 3-D printer at Graphic Design Services in Scottsdale. "As a design engineer, I was interested in 3-D printing," Barrett said. "Maybe this was an opportunity for me to learn more." Dan Perlmutter, owner of Graphic Design Services, had purchased a 3-D printer about a year earlier, and he saw an opportunity, too. It opened a new field for his work. Previously, he had been using the printer mostly to create prototypes of mechanical parts. More advanced 3-D printing work is being done with medical and scientific applications, as well as manufacturing. First developed in 1984, when an inventor learned how to print three-dimensional objects through successive layering of materials, 3-D printing moved into plastic extrusion in the 1990s. By 2005, it had reached the do-it-yourself and home-hobbyist markets, with prices dropping to $3,000 or less. Using the designs he found on the Internet, Barrett fashioned a prosthesis with a glove Kamarata purchased from Home Depot, some high-strength braided fishing line and screws. Each finger section was printed, three pieces for each digit. They were connected with pins, forming hinged joints. Wires ran from the back of the glove to points under the fingers, and it could be operated by the movement of the joint below the nubs. The fingers could flex just enough to allow Kamarata to grasp objects. It cost less than $100 for materials and time on the printer. But the value for Kamarata was priceless. "I was able to hold things again," Kamarata said. "I could pick up a water bottle." The only drawback was that his hand would get hot in the glove. The new hand restored his self-esteem and put his life back in order. It was time to help others. While testing the first device, Barrett introduced Kamarata to a neighbor, Matt Augee. Augee runs the RecFX Foundation, which provides support to family members, especially teens, of active service members. "It was a good fit," Augee said, pointing out that Kamarata is a Navy veteran and that many service members have lost limbs in Afghanistan and Iraq. Our goal is to do it cheaply. We want to drive down the price. We got to this level of functionality without any expertise. Kamarata said Augee was fascinated with the new hand. By this time, Kamarata could pick up most objects, dial a phone, carry a plate. Other victims of hand injuries could use such a device, especially at the low cost. Augee brought in the ability to raise donations — money and materials — through the foundation. Donors could take tax write-offs. The goal is to provide prostheses similar to Kamarata's to others who have lost fingers for little or no cost, with a focus on veterans. "Our goal is to do it cheaply," Augee said. "We want to drive down the price. We got to this level of functionality without any expertise." He already is working with a patient in Pennsylvania, who found the group through an article in the Anthem News, a housing-development newsletter near where Kamarata lives in north Phoenix. He has gotten some donations of materials and has found a physician in Black Canyon City who wants to work with the group. Randy Hancock, an orthopedic doctor, runs the Black Canyon Community Health Center, and he sees hand and finger injuries among his rural patients. "We're not medical people," Augee said. "It is not rocket science, and it does not require an engineering degree." He wants to identify more people who need help, attract designers to help with design, printing and fitting, and raise money to provide the prosthetic glovesfor free. "That's my passion," Kamarata said. Penn State University Using Precision 3D Filament!